As youth workers, we all have our vision—the plan we hope to make real in our ministries—to change the lives of teenagers as we introduce them to Jesus. But how often have you found yourself wondering if your picture is just wrong—or thinking you just don't know how to make your ministry match what you envision? 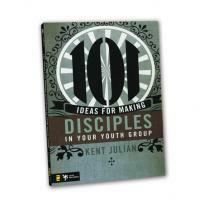 In 101 Ready-to-Use Discipleship Ideas you'll explore the idea of ACTS to create a disciple-making ministry with the elements needed to create an environment necessary to cultivate this mission. ACTS represents everything a missional youth ministry needs to be about: Adoration — More than an act, this is a lifestyle that is fleshed out in expressions of prayerful dependence, deep gratitude, and expectancy in what God can do.community — This is an atmosphere of genuine caring, authentic relationships, and unity based on Christ's love for his Church and the Church's love for one another. Truth-and-Grace — The basis of everything that is taught and valued, this is a setting where God's Word is the standard and central to belief and behavior. Serving-and-Sharing — As a way of life, serving involves helping the whole person by ministering to both believers and the lost by meeting their needs, as well as verbally sharing God's message of grace. As you dig into each aspect of ACTS, you'll discover Jesus' style and see how he cultivated each element in his own ministry. Then you'll explore the youth ministry style of each aspect, where you'll find 25 hands-on, easy-to-implement ideas on how to cultivate the same element in your context in order to create an environment of disciple-making that finally fits your ministry.